Fill a large stock pot with water and place over high heat. Add the bay leaves, yellow onion, garlic and a couple tablespoons of salt and bring to a boil. Once the water is at a boil add the octopus. The octopus will take approximately 75-90 minutes to cook. To check the doneness of the octopus, cut off a tentacle from where it attached to the body. Slice a piece of the tentacle and taste it, the texture should be tender with a little chew. If the texture is rubbery place the octopus back in the boiling water for 15 minutes and check again. Once the octopus is tender remove it from the water and let it cool. Remove all of the tentacles and reserve the head for another use. Place a medium pan over medium heat and once preheated add the bacon. Cook the bacon until crisp and well rendered. To the pan at the octopus tentacles and coat them well with the bacon fat. Cook until the octopus is warmed through approximately 3-5 minutes. 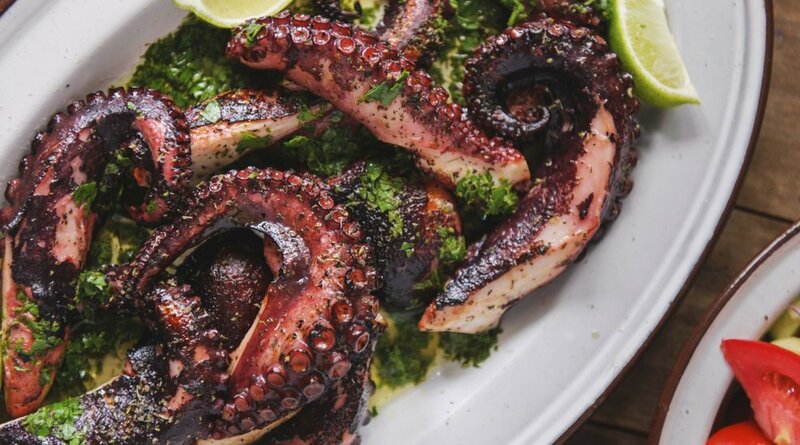 To plate, place a large spoonful of the ramp salsa verde a plate, followed by couple of octopus tentacles coats in the bacon, drizzle with the fish sauce caramel and garnish with cilantro leaves and enjoy! 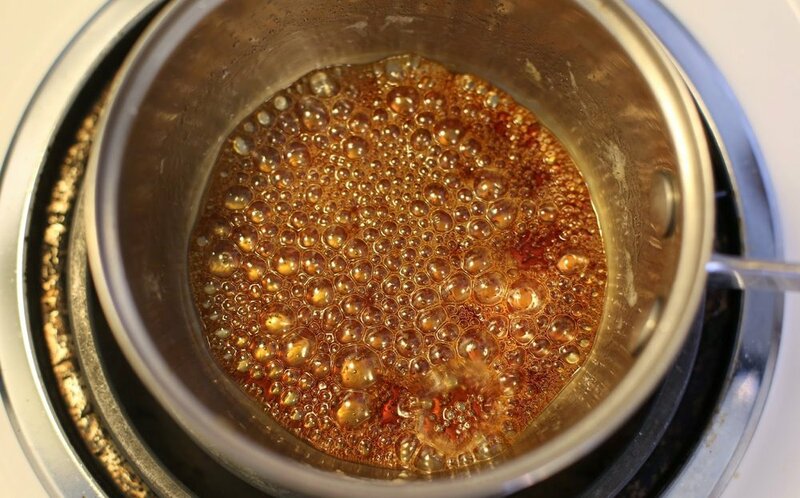 Add the sugar, the ¼ C water and corn syrup to a small pot and place over high heat. The mixture will come to a boil and start to caramelize, this will take 5-7 minutes. Carefully swirl the pot every minute to keep the caramelization equal. Once the mixture reaches 340°F or is a medium dark amber color carefully add the remaining ingredients including the other ¼ C of water. After the mixture stops bubbling stir well let cool and store. To serve gently warm in a pot or in a microwave. Lightly grill or sauté the ramps for 2-3 minutes just to lightly wilt them. Add all of the ingredients to a small bowl and mix together. Season with salt and freshly ground black pepper and serve.